Location: Forest trail to Serra del Catllaràs to some 12 Km. of the centre of La Pobla de Lillet (Berguedà). Present condition: Façades and interior: Correct, but with changes modifying the design of Gaudí. By car: The chalet is found to 139 Km. of Barcelona and 78 of Manresa, by the C-16, when arrived to Guardiola de Bergadà, take the road B-402 in direction to La Pobla de Lillet. Arriving at the Km. 9 there is a deviation on the right with the indication of Santuari de Falgars, from here a trail indicated of 6 Km should be caught carrying to the villa. With good weather the travel can be done by car although is recommended a vehicle all wheel car. A good alternative is to go on foot – in an hour and a half – from La Pobla de Lillet (Neighborhood of Coromines) following a trail signaled with long and yellow marks. By Bus: Through the Company Alsina Graells phone + 34 93 265 65 92. Barcelona – Manresa – Berga – La Pobla de Lillet. Or Company Manel Mir Vila phone + 34 972 70 30 12. Ripoll -Campdevànol – La Pobla de Lillet. The buses do not arrive to the villa, from La Pobla de Lillet continue on foot or by car (better an all wheel car). By train: RENFE, Barcelona-Ripoll or Campdevànol. From there to La Pobla de Lillet by bus with the Company Manel Mir Vila (Tel. + 34 972 70 30 12). Ripoll-Campdevànol-La Pobla de Lillet. From there continue on foot or by car. Visits: The building is at present a holiday camp and it is totally adapted to that function. The knowledge that the Catllaràs Villa is a work of Gaudí, is recent. This original construction passed a long period in which it was all ignored on the identity of its author. Still today we continue without no known document to prove this. 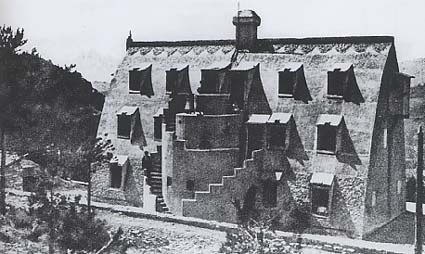 The first chronologies of Gaudí works did not include the Catllaràs Villa. The first documented reference, is the report published by the architect A. Viladevall in the magazine “Cortijos y Rascacielos” published in Madrid (nº 35 of 05-06-1946). This architect refers to a conversation with Domènech Sugranyes Gras (collaborator of Gaudí in the Sagrada Família) in which he said that Gaudí explained him in a conversation his responsibility to build the Villa. At present the responsibility of Gaudí is generally accepted, even by specialists as the architect Joan Bassegoda Nonell Teacher assigned to the Gaudí Chair. The power needs for the cement production in the new factory of the Clot del Moro (1901-1904) built by the architect Rafael Guastavino for the company Asland of Eusebi Güell i Bacigalupi (Count of Güell), are the origin of the project of this villa that Güell (sponsor of Gaudí) entrusted him probably around the year 1901. Really, the coal Catllaràs mines were very far from the factory of the Clot del Moro to which its production went destined and of any inhabited place. This was the reason to build a housing for the technicians and another personnel working in it. To raise the construction, a place called “Els Prats” was chosen, near the mines and in a natural environment surrounded by fields, without forest, allowing a magnificent vision on an environment of splendid landscapes. It was started in the year 1902 and developed in two phases keeping in mind the adverse climatic conditions, with very hard winters. By this reason, during the first phase the structure was built, and also the exterior closings, the central chimney and a part of the visors of the windows corresponding to the ground floor. Subsequently and in a second phase, the works were completed supposedly in the year 1903. After a period of intense productive activity in the Catllaràs mines, in the year 1932 the chalet was transferred to La Pobla de Lillet City Hall. 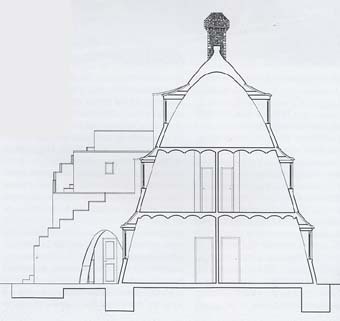 During a period of hardly political instability and of stop of the economic activity, aggravated in the artistic field by the triumph of the Noucentisme that defended a very different artistic conception and aesthetics concepts radically faced to the Modernism (Catalan Art Nouveau) and Gaudí, the villa lived a progressive deterioration, despite some interventions (see further down “The alterations”) devoted to adapt the building to new applications more than to assure a true reconstruction. This situation was aggravated as a result of the civil war and the post-war period that left the villa in an almost ruinous state. 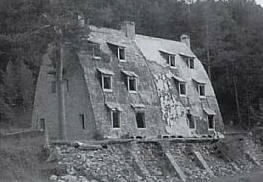 Already in the year 1907, the chalet suffers the first alterations consisting in a change of the slope of the visors of the windows and in the cement recover of the initially river stones base cover. Again we notice new alterations in the year 1940 because the building was in a very bad conditions. From 1971, the villa suffered new alterations, to adapt it to the new function as a holiday camp, altering much more its initial look. The staircase who was the central element of the façade, duly theoretically to practice reasons, was substituted by another metallic stair without any relation with the original project. Also the initial covering of the facade was substituted by artificial slate. Likewise the interior suffered important alterations. Here we will develop a summary on the original building designed by Gaudí, because the construction in its present state, has lost many of its interesting characteristics. It was a matter of a building of three plants with two dwellings by plant (total six), with a maximum height of 10 meters. The structure has form of barrel vault with closed sides forming the lateral façades with some openings with two projecting, one in each side, in the shape of the attic to lodge the toilets. The cover is at the same time roof and façade and inside this dual function can be considered for the openings so much as windows or skylights. Initially the base was covered by river stones but subsequently it was recovered with cement. This cover was crowned by a culmination also decorated with river stones. The two chimneys of the ensemble one is emerging from the centre of the roof – that chimney collected the smoke of six stoves located in each of the three floors of the building -, the other chimney following the vertical wall closing the vault, was only to evacuate the smoke of a room of the ground floor. It is to remark the perfect assemblage among the cover and the staircase. One of the most interesting elements of the house was the staircase today destroyed. This staircase was, as the present one, located in the south-western facade, besides its function as element of communication among the floors of the building, it contended inside its body the following elements: in the ground floor two doors to the dwellings, two laundries, two baths and a coal bunker. In the first floor also the two doors to the dwellings, two baths and a junk room. Therefore, this staircase presented an interesting plurifunctionality and contended essential elements for the life at the interior of the building. The interior of the villa was characterized for an almost Spartan simplicity, eliminating all the superfluous thing, the useless spaces and maximizing the comfort. Each one of the three plants of the villa had two apartments with direct access to the staircase, in the ground floor the kitchens and dining rooms were found besides. 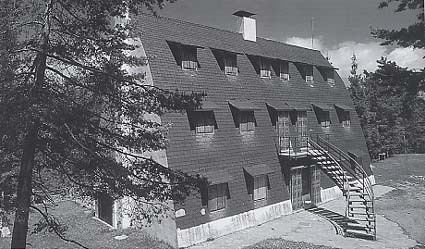 Due to the structure of the building, the useful surface of each plant went reduced from the ground floor to the attic. The apartments had interior divisions, less in the upper plant, in which each apartment had a single room (see plans). The comfort criteria were not only organised by the available space, but also by other functional aspects to attribute the apartments by professional categories. Thus, the personnel of maintenance and service was situated in the ground floor, therefore in an area in direct contact with the floor, with the worst thermal isolation and with the eventual smells of the kitchens and dining rooms. The executive and technician personnel with his families was situated in the intermediate plant, in a zone with better isolation and protected of the outside by the upper and lower plants that acted as air chambers. The third level, is supposed to lodge the subordinate personnel or used as space of alternative uses. In opinion of Joan Bassegoda, Gaudí achieve in that building a perfect symbiosis between the aesthetics en the functionality. This symbiosis, is one of the more impressive and fascinating aspects of this building and in general terms of his architecture. * Images published under the authorisation of Editorial Amalgama, Edicions-Recerques del Bergadà, editors of the book “Gaudí in the Vall de Lillet” which authors are Joan Bassegoda, Ramon Espel and Roger Orriols.